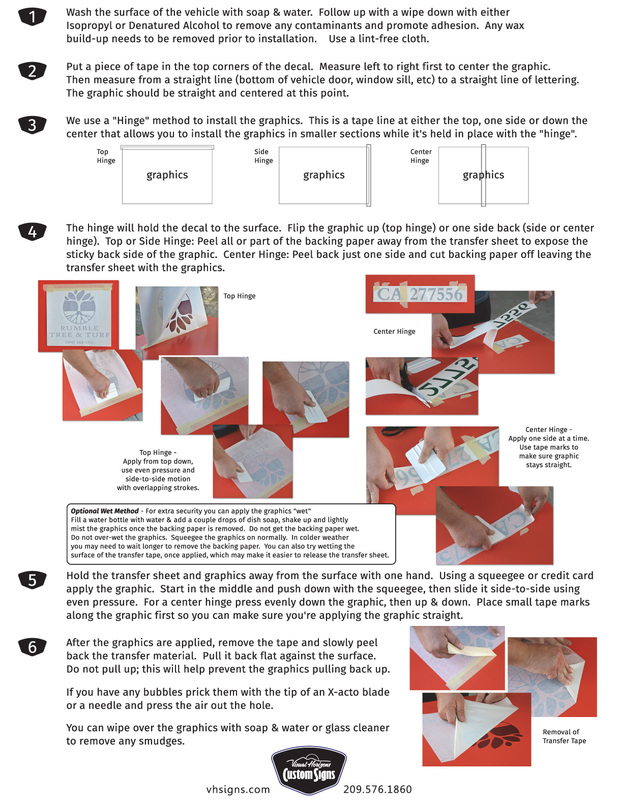 Click here to download decal installation instructions. We get questions about high quality photos for use on wraps and signs. A great source for photos are stock photo sites. One we’ve worked with is iStockPhoto Just search and scroll through thousands of photos and illustrations. Jot down the #’s for the photos you like and we can either download them for you at the price listed, or you can download them and bring them in to us. * Vector files such as .ai, .eps, .pdf can sometimes contain embedded raster files. Please check before submission. We suggest a resolution of 100-150 dpi at 100% file size or 200-300 dpi at 50% file size on all raster based designs. Vector based files can be reduced or enlarged to almost any size without losing quality; resolution is irrelevant. Artwork must be vectored for vinyl cut or router cut letters and/or shapes. If you are submitting files that contain text please make sure that the text is outlined (vector formats) or flattened (raster formats) before submission. We recommend that all files, regardless of size, be compressed with a program such as WinZip or Stuffit prior to Email or Upload. JPEG files must be saved with maximum quality setting checked. Leave at least 2.5” (at final print size) around the edge of printed banners for hem and grommet. When not using your flexible magnetic sign, keep it in a clean, dry place. Store your magnetic flat. Be sure they are on a level surface. Avoid placing objects on top that could damage the face. Do not stack with magnetic sides facing each other. Clean the metallic surface with Windex and allow to dry. Affix to a smooth, flat or gently curved metallic surface. Make sure the entire magnet is flat against the metal surface with no air pockets. To reposition the magnet, remove the entire magnet from the surface and reaffix. Do not pull the magnetic sign across the surface, as it may stretch. Avoid use on horizontal metal surfaces exposed to direct sunlight (such as automobile hoods) or temperatures exceeding 150 degrees F.
Avoid use on non-metallic body fillers, simulated wood grain siding and repainted surfaces. Avoid excess driving speeds when using your magnetics as they may blow off if not properly cared for. Remove magnetics in areas where they may be stolen, as this can happen. To guard against moisture and dirt buildup between the magnet and the metal surface, remove the magnet at regular intervals. The front of the magnetic can be cleaned with Windex. The brown magnetic back may be cleaned with soapy water. Wipe with a soft cloth or allow to air dry. To protect fresh clear coat, base coat and/or vinyl surfaces on new cars and trucks, remove magnetic signs daily. Proper use and care will extend the life of your magnetics and protect the metallic surface or your vehicle.